does this make me cheap or resourceful? this was my lunch yesterday. 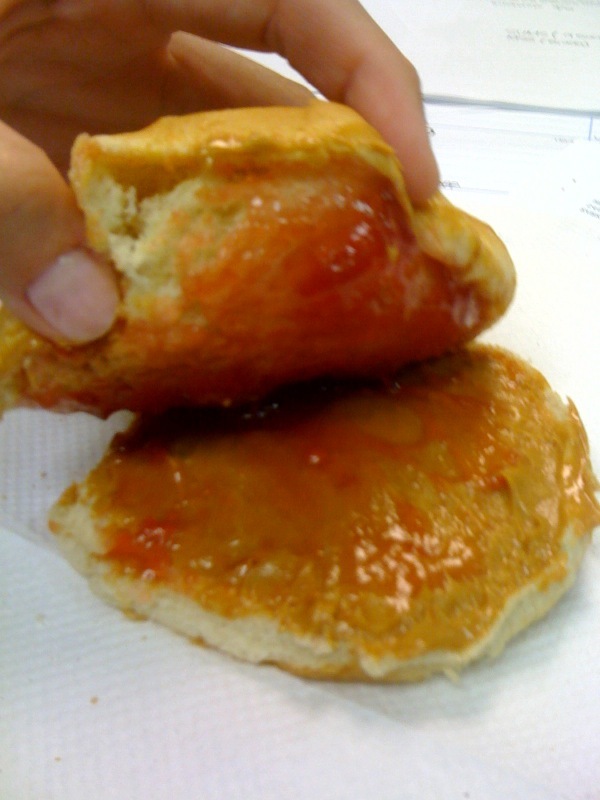 a peanut butter and jelly bun. we ran out of bread. but we have hamburger buns. so i refuse to buy more bread. because then the hamburger buns will just go bad. oh and, on monday i did have one flat bread left. and i noticed there was a tiny little bit of mold on one side. so...ummm...i might have just torn that piece off. but i'm sticking with resourceful. OMG!!!! (on my goodness) Stop eating the penicillin bread. Is this my fault because of the ant cereal? OK.... i know you're big on being resourceful and I appreciate that about you....but can we just think this thru....bread doesnt cost THAT much money in the whole grand scheme of things...and birds LOVE stale bread. Do you need a bread maker? The mere smell of the fermenting bread makes me gag....Some molds have roots...and some could be harmful. It's a fungus ...and you wont even eat FRESH mushrooms! STOP IT WITH THE MOLD CONSUMPTION! Be kind to your tummy.....and feed it properly! you get my vote for resourceful! you know that you can also eat cheese that has mold on it as long as it is a hard cheese, just cut off that part and it is fine! as far as the bread, this tactic will come in handy when you have kids and are out of bread, just tell them it is a specialty sandwich and they will think it is cool!